Designed for industrial and commercial environments, The Ti29 is the perfect balance between performance and price. With powerful 280x210 IR resolution, superior spatial resolution, and a high definition display the Ti29 delivers crisper images than the competition. Finding a potential problem before it becomes a costly disaster shows you just how much a Fluke thermal imager can save you in time, money and even lives. With its rugged body, integrated lens cover, protected display and 2 meter drop test, the Ti29 is designed to handle the harshest environments. 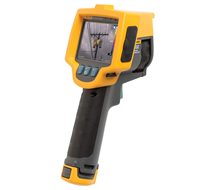 The Fluke Ti29 also offers the only on-camera blended infrared with patented Fluke IR-Fusion® technology precisely aligning visible and IR images to better diagnose issues.